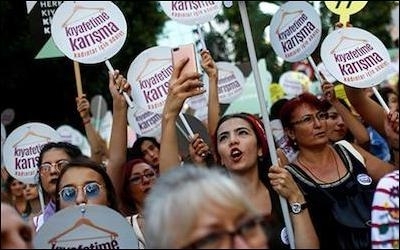 Hundreds of Turkish women protested in Istanbul on July 29 against the increased violence they face. 70% of Turkish women report having been physically assaulted by their partners or family. Turkey increasingly features all possible social and political reflections of Islamism: authoritarianism, majoritarianism and officially-tolerated intolerance to everything Islamists may deem "un-Islamic." Women are often the target group, and might not avoid intimidation even if they dress in line with the Islamic code.